Pioneer India Electronics, launched its Z series under the touch screen car stereo segment. The Z-series bring premium in-car entertainment features to the masses. Z series car stereos comes with a newly redesigned circuit board which delivers superior sound quality. The line up includes four new models AVH-Z7050BT, AVH – Z5090BT, AVH – Z2090BT and AVH – Z1090DVD. The AVH – Z5090BT is all set to power up your car with latest features such as Android Auto, Apple CarPlay, AppRadioMode+, MapMyIndia offline navigation & full HD video playback with a 7 inch WVGA touchscreen, and its priced at Rs. 29,990. The new AppRadioMode+ allows users to playback both downloaded videos and live streaming videos from a smartphone on the car stereo’s touchscreen using just the USB cable. 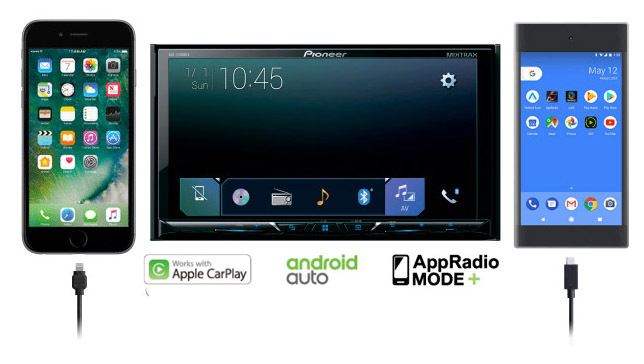 With enhanced smartphone connectivity, the Pioneer car stereo automatically detects and connects to an iPhone or Android device without any complicated time-consuming setup routine. One can also enjoy high resolution movies using a portable hard drive as the system supports hard drive playback. The simple and easy interface with superior in car AV performance makes it the ideal choice for those who want unmatched quality entertainment in their vehicles. Additionally, the AVH-Z7050BT, AVH – Z2090BT & AVH – Z1090DVD are priced at Rs. 44,990, Rs. 24,990 & Rs. 21,990 respectively. These car stereos are packaged with features such as Apple car play, HD videos, MapmyIndia offline navigation and much more. Customers can enjoy full HD videos through the improved 24-bit True colour screen for significantly richer hues. Also, a new highly customizable and intuitive graphical user interface ensures a truly seamless operation for customers. With an interface that is really simple and built for driving, Android auto makes your favorite apps really easy to use in a car. Android users can now enjoy smartphone’s navigation, messaging, music, Google talk & much more. Apple CarPlay gives iPhone users an in-built way to make calls, listen to music and access messages with just a word or a touch while on the go. MapmyIndia can now be accessed with the AppRadio Mode and supports detailed map coverage, realistic 3D Landmark, terrain & city models for better recognition and supports live traffic updates in 27 cities. Steering mounted audio controls of your car can now be retained with the learning SWC feature. Z series AV receivers can now play full HD (1080P) videos from files encoded in a wide range of digital formats stored on USB devices. The touchscreen stereo displays connected smartphones which eases the process of switching between devices. Users can move the icons and personalize the display.